Coleslaw – or slaw, for short – is a fantastically versatile side dish. Composed primarily of finely sliced ribbons of red and/or white cabbage, slaw is able to adopt and absorb any flavours successfully, usually to delicious effect. For me, however, white cabbage slaw always has an “Asian” feel about it – my apologies for the generalisation. This Asian Sesame Seed Slaw, for instance, benefits greatly from the presence of just a little sesame oil, a sprinkling of toasted sesame seeds and a pinch of chilli flakes. Seasoned similarly, it makes the perfect accompaniment to almost any noodle dish, but also as a fresh dish alongside a curry. 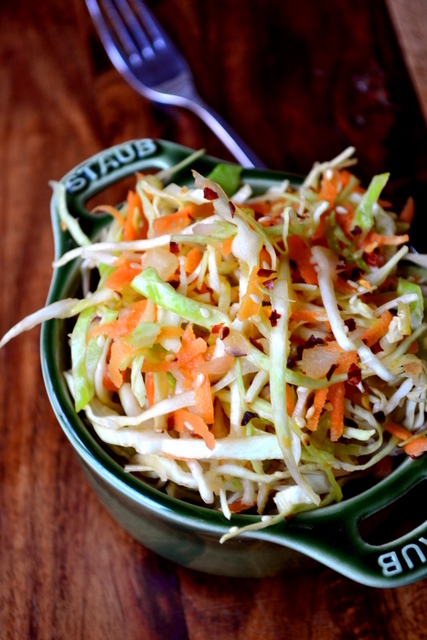 Slaw is a staple of our weekly menu. Quick to make and devastatingly flavoursome, it makes a mouthwatering side dish and filling, frugal and nutritious lunch when stuffed inside a pita bread, or accompanied by a portion of rice. If you’ve seen my recipes for Spiced Red Cabbage Slaw or Winter Red Cabbage Slaw, you’ll know that it never gets boring either; change up those flavours… experiment to your heart’s content. As with other coleslaws, the key to achieving success is to make sure everything is very fine and crunchy. Your cabbage should be fresh and, if possible, a mandolin should be used – but watch those fingers! Remember to season liberally; being heavy handed with flavour when it comes to recipes like this goes an awfully long way. Most of all? Tuck in and enjoy for lunch or dinner. Mix together the cabbage, onion and carrots together in a large mixing/serving bowl. Gently toast the sesame seeds until lightly browned – be careful not to leave them unwatched as they could become bitter. Add the sesame seeds and other remaining ingredients to the vegetables and combine thoroughly. The slaw will last in the fridge for up to 3 days, if covered. Cost: Like my other slaw recipes, this Asian Sesame Seed Slaw is incredibly inexpensive – it’s only a few vegetables after all! Indeed, you could easily prepare it for as little as 75p – it lasts for 2-3 days in the fridge too! in Thailand they might add some slivered, slightly underripe mango and a handful of tiny dried shrimp too. I will mess with this recipe tonight. Thanks. That’s a delicious idea! I’ll have to change things up a little. 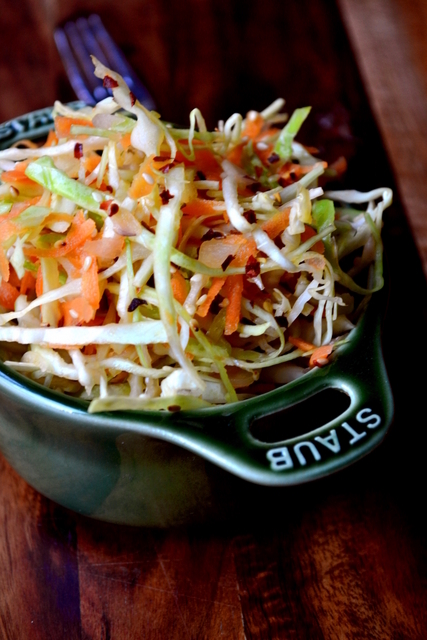 This is a wonderful slaw recipe. Love the flavor of sesame seed oil and I know it will be delicious with cabbage. We eat quite a bit of slaw too. I’ll make it this weekend! 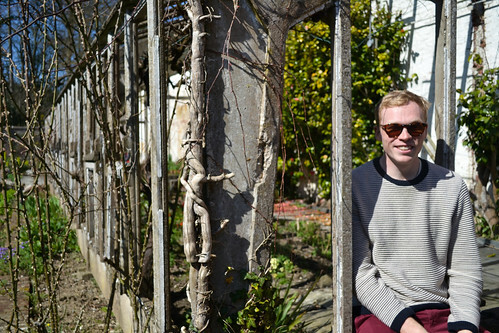 Thank you – I hope you enjoyed it! This sounds tasty – love the idea of sesame in there 🙂 nice to see you posting! Thank you; I’ve been so busy recently. Hard to get everything done! Looks gorgeous and I love sesame oil. In fact, am just packing to move house and have come across 3 bottles in the cupboard so I need to use more of it! Blimey; you have quite to back-log! Love this, but wonder that no ‘tasteless’ oil or acidulating ingredient appeared in the recipe . . . 🙂 ! Sesame oil at its best [and I use it most days] has such a ‘limited amount’ usage!! 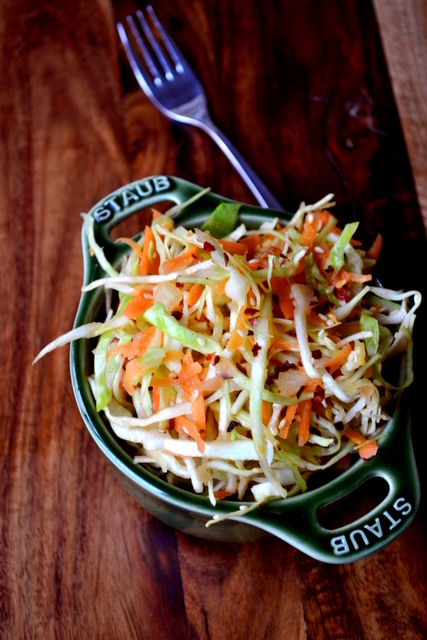 I love adding sesame oil to coleslaw – totally changes the flavour. So good! Oil is a must from me; far less interesting without. sounds absolutely yummy!! and I love the little Staub dish – is it porcelain or cast iron? Porcelain; they were an absolute bargain and I love them! I will certainly try this next salad that I make ! I’ve just prepared our evening meal , so I’m ” vegged” out at the moment . Ratatouille tonight ! Oh, my favorite! This is an annual summer dish in my kitchen. Pretty sure I’ve already made it more than a handful of times over the past couple of months. It’s the perfect side to fish tacos or really any fresh summer meal! I’m always making slaw, at least two batches a week. IT’s a flat favourite. Very nice! I think sesame has been under-appreciated and under utilized.Great job! OH it definitely have. I always use it when I’m making a slaw. Just wondering if it would be better to add sesame seeds as and when serving the slaw , to keep their little crunch . Sesame oil is my most favorite oil. I am so much looking forward to your recipe!